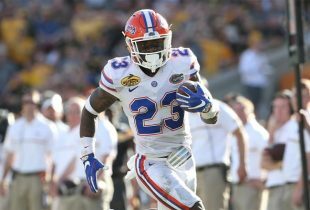 The 2014 NFL regular season continued this week with 38 former Florida Gators spread out over 22 of the 32 teams in the league. Eleven teams had multiple Florida players on their rosters including Miami (four); Philadelphia (three); and Baltimore, Cincinnati, Denver, Indianapolis, Kansas City, N.Y. Jets, Pittsburgh, St. Louis and Tampa Bay (two each). Below are full game statistics for all 29 players (18 starters^) that saw action along with select status and injury updates on some Gators during the 13th week of the regular season. » Haden has nabbed an interception in three-straight games and also forced another the week preceding the start of his streak. » Jenkins’s 16 tackles were a career-high and marked his third game with 14+ tackles this season. » Purifoy was cut by Indianapolis this week and claimed off waivers by Seattle. On Monday, the Seahawks cut Purifoy after he failed his physical with the team. This guy was at one time projected to be a first round pick. I hope for his sake he can get his head together. Wonder why he failed the physical, hopefully not because of cannabis. I’m not sure Matt Jones is making the right decision either, although with his previous injuries perhaps he thinks it is his best chance. I hope he can make a roster, he gave it his all at Florida and I wish him the best, we will miss him next year.